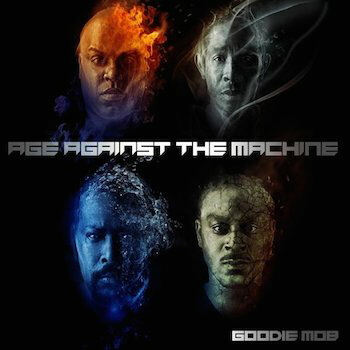 RapReviews.com Feature for March 18, 2014 - Goodie Mob's "Age Against the Machine"
In 2004 one of the most important rap groups of the 1990's seemed to be irrevocably fractured. The title and cover art of Goodie Mob's "One Monkey Don't Stop No Show" suggested a not well hidden resentment at the solo success of Cee Lo Green in blatantly disparaging terms. The irony is that this bitterness overshadowed what was otherwise a decent to above average album, and pointing out Cee Lo's absence made it feel like a tainted product. It's as true in rock music as in hip-hop - in an acrimonious break-up there are a lot of losers and few winners. Apparently it didn't take long for Khujo, T-Mo and Big Gipp long to figure out which side of that equation they were on - by October 2006 they squashed the beef at one of Cee Lo's concerts as Gnarls Barkley. Now it's clear Cee Lo accepted the apology and that his promises that Goodie Mob would reunite for an album were genuine, but once Pandora's Box had been opened, things weren't going back to status quo any time soon. Cee Lo's fame and popularity have only continued to increase in the interim, leading to a trophy case full of music accolades and a recurring presence in pop culture, not the least of which was a stint hosting The Voice on NBC. As weeks turned to months and months turned to years, occasional quotes from the inner circle would suggest "we've been in the studio" or "we've got X number of tracks recorded." There's no ignoring the simple facts though - it took nine years to get from "One Monkey" to "Age Against the Machine." Even if you start the clock from the day they all squashed the beef, that's seven years. There are fine liquors that spend less time maturing in the barrel than this album. "Maturing" is a suitable word for this fine "Aged" album though. Every member of the group is either in their late 30's or early 40's. The youthful exuberance of "Soul Food" in the mid-1990's led to an instant hip-hop classic. They were the spiritual extension of a movement led by OutKast, shaped by Organized Noise, and collectively referred to as the Dungeon Family. "Who's that peeking in my window?" Before that gun can go "pow," these elder hip-hop statesmen have a message brought to you by the 11th letter. Now there I've said it - yay! Heh, and why this collaboration has to be, completely, color coordinated"
The production of Dungeon Family producer Kawan 'KP' Prather and collaborator Malay provides a powerful and transformative vision on "Kolors." It's a seasonal song that changes like nature on the calendar, with pianos budding like the trees of springtime, and a gentle breeze and echoing vocal background carrying us into summer, until the drum track attacks like the first bite of fall's cold. As each member of the group has their moment in the song, the presentation reminds long-time listeners of Goodie Mob's artful youth, now tempered and slightly weary from two decades of experience. "It's a quiet storm, right in front of your face" as the song slowly winters with a cold wind blowing in at the 4:36 end. "Special Education" is a clear sign that despite a long absence, Goodie Mob hasn't lost their swagger, and Janelle Monae's chorus hits the nail on the head: "I'm just different and I don't care/It's kind of sad and it's a shame/how every one wants to be the same." They've never had to worry about being the same - they've only had to worry about getting along. They may have aged some but the crux of their internal struggle will remain the same - Cee Lo is to the Goodie Mob as Busta Rhymes was to Leaders of the New School. It can't be helped. When he croons and raps on songs like "Nexperiance" you know who the definitive star of the group is, and though they share the songwriting credit Cee's voice is the only one heard. He's not purposefully being big time - he works fine in any group song featuring the fab four - but he's still their brightest shining star. That said the Goodie Mob crew do benefit from Cee Lo's tendency toward eccentricity, making "Age Against the Machine" a more experimental and intriguing album than it would be without him. "State of the Art (Radio Killa)" is a song Cee produced himself that has the urgency of an emergency, complete with ambulance sirens racing by. It will quicken your pulse with just one listen. "Using speakers as a weapon - we at war!" The Get Cool produced "Pinstripes" featuring T.I. is an unapologetic "middle finger, to the sky" Steve Austin style. Floyd the Locsmif gets funky smooth on "Understanding," a seductive ode to the rap group's better halves. Even short songs like "Power" pack a big punch, in part due to The Grey Area sampling the Moody Blues, and Cee Lo rapid-firing his way through it like a Gnarls Barkley track. For the non-deluxe version of the album, the Caviar and OZ "Father Time" is a fitting ending. "Used to listen to the tape pop" is a sentiment rooted in nostalgia, but it's the "Southern realistic flow" that keeps them up to date despite time's inexorable march. Goodie Mob gave us "+Food+ for your +Soul+ to nourish your brain" and still continue to do so today.